You have a lot of options for replacing missing teeth, from state-of-the-art dental implants to affordable, but effective partial dentures. 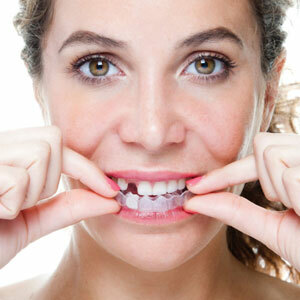 But if the teeth in question have been missing for a while, you may first have to undergo orthodontic treatment. Here's why. While they may feel rigid and firm in the jawbone, teeth are actually held in place by periodontal (gum) ligaments. These elastic tissues lie between the teeth and the bone and attach to both with tiny filaments. This mechanism allows the teeth to incrementally move over time in response to biting pressures or other environmental factors. When a tooth goes missing the teeth on either side of the space naturally move or "drift" into it to help close the gap. This natural occurrence can reduce the space for a restoration if it has gone on for some time. To make room for a new prosthetic (false) tooth, we may have to move the drifted teeth back to where they belong. If you're thinking metal braces, that is an option—but not the only one. Clear aligners are another way to move teeth if the bite problem (malocclusion) isn't too severe. Aligners are a series of custom-made, clear, plastic trays worn over the teeth. The patient wears each tray, slightly smaller than the previous one in the series, for about two weeks before changing to the next one. The reduction in size gradually moves teeth to their intended target position. Many adults prefer clear aligners because they're nearly invisible and don't stand out like metal braces. They're removable, so you can take them out for cleaning or for special occasions. And, we can also attach a prosthetic tooth to the tray that temporarily covers the missing tooth space. Whichever orthodontic treatment you choose, once completed we can then proceed with restoration to permanently replace your missing teeth. While it can be a long process, the end result is a beautiful smile that could last for years to come. Doctors with a conservative treatment philosophy. A staff that’s friendly, fun-loving and caring. Fees that are fair and up-front. A State-of-the-art facility utilizing the latest and best in braces, wires and equipment.